^ Harry McCracken (November 20, 2008). "The Twelve Greatest Defunct Tech Magazines Ever". Technologizer. Archived from the original on 2015-08-09. Retrieved August 3, 2015. ^ Computer Science Resources: A Guide to Professional Literature. Google Books. April 18, 2006. Retrieved August 24, 2010. ^ Fire in the Valley: The Making of the Personal Computer. Google Books. 2000. Retrieved August 24, 2010. ^ From the Ether, By Bob Metcalfe, Page 46, InfoWorld. Google Books. August 23, 1993. Retrieved August 24, 2010. ^ From the Ether, By Bob Metcalfe, InfoWorld. Google Books. December 13, 1993. Retrieved August 24, 2010. 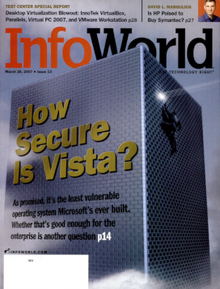 ^ InfoWorld Through the Years, InfoWorld. Google Books. Retrieved August 24, 2010.